Diana’s original silver and carbon fiber ring is a great ring for men and women as well. Wear it as jewelry, as a wedding band, or a backup wedding band if your original band is too valuable to risk at work or doing something like water sports. 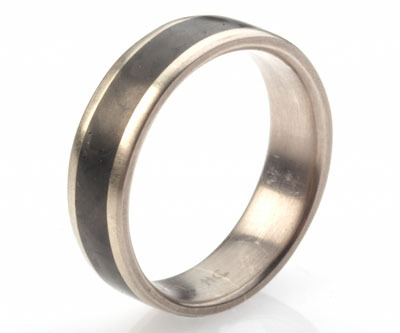 The rings are made one at a time by hand, and feature a beautiful matte finish which remains consistent with wear.